The numbers represent the probabilities of transitioning between the various states, or of emitting certain symbols. For example, state S1 has a 90% chance of transitioning back to itself; each time it is visited, there is a 50% chance that it emits a ‘1’, and a 50% chance that it emits a ‘2’. 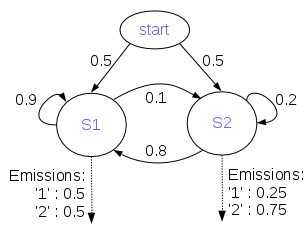 Clearly, this model can be used to produce strings of 1s and 2s that fit its parameters. But we can use it to solve a much more interesting question: given a string of 1s and 2s, which sequence of states most likely generated the string? This is why it’s described as a hidden Markov model; the states that were responsible for emitting the various symbols are unknown, and we would like to establish which sequence of states is most likely to have produced the sequence of symbols. Let’s look at what might have generated the string 222. We can look at every possible combination of 3 states to establish which was most likely responsible for that string. The string 222 was most likely generated by the sequence S2 – S1 – S1. That may be a little surprising, since S2 is much more likely than S1 to emit 2s, but the transition probabilities show that the model is generally much more likely to be in state S1. When the string of observations to explain is very long, this enumeration of every possible sequence of states becomes infeasible. We had to enumerate 2^3 possible sequences for a string of length 3; if the string were of length 400, we would need to enumerate 2^400 (about 2.6 * 10^120) sequences. Instead, we can employ a dynamic programming approach to make the problem tractable; the module that I wrote includes an implementation of the Viterbi algorithm for this purpose. A good example of the utility of HMMs is the annotation of genes in a genome, which is a very difficult problem in eukaryotic organisms. 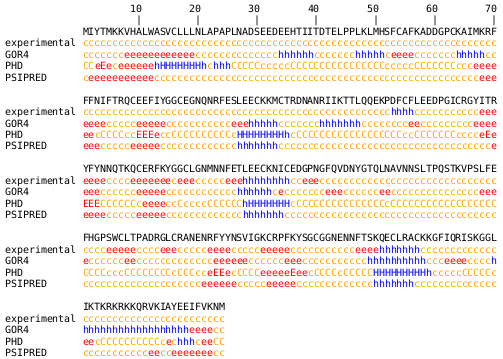 A gene typically consists of a promoter region, numerous exons and introns with their associated splice sites, and a poly-A region, among others. A model can be created to describe each of these regions. The most likely sequence of states that explains a genome can then be calculated. Each nucleotide in the genome would be annotated with a probable state, indicating whether it is likely to be part of an intron, exon, splice site, intergenic region, etc. There are a wide variety of real-world applications for HMMs, such as in signal processing, or in identifying secondary structure elements in proteins, parts of speech in sentences, or components of musical scores. Note that the probabilities are log (base 10) transformed, as they will be very tiny numbers for long strings. As I mentioned in my prior post, assessing classifiers can be a difficult task. In this post, I’ll look at an example of a multi-class classification problem, and discuss good metrics for assessing the performance of tools designed to solve the problem. This post does not claim to analyze the overall efficacy of these three tools; only their performance with TFPIα is assessed, for the purposes of studying metrics. 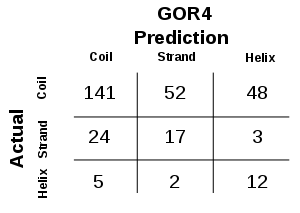 For this protein, GOR4 shows a tendency to mispredict regions of coil as extended strands or helices. There is also a pronounced tendency to mispredict strands as coil. 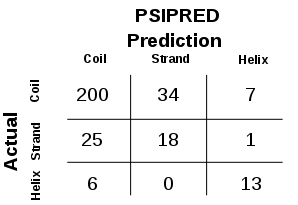 In comparison to the prior matrix, the coil mispredictions are still present, though less pronounced. 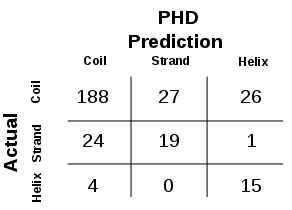 There is less tendency to mispredict coil residues as helices, but, when compared to PHD, more tendency to mispredict coil as extended strand. When assessing secondary structure predictions, it is insufficient to look only at the Q_total score. Why is that? It is notable that TFPIα is 79% random coil. A tool that blindly predicts ‘c’ for every residue would receive a very good Q_total score of 0.79, better than all three of these tools. But that is an uninteresting prediction; we would need to consider all four of the scores when assessing these tools in order to correctly dismiss this hypothetical tool. As I mentioned in the last post, it is often useful to have a single metric for comparing such classifiers. Clearly, Q_total does not fit the bill, which corroborates my statement in the last post that “accuracy is a poor metric.” One excellent metric for multi-class classifiers is “confusion entropy,” or CEN. This technique accounts for every cell of the confusion matrix, measuring the entropy in the mispredictions in every row and in every column. This provides a single number that is very representative of the overall predictive power. The CEN scores range from 0 (indicating perfect classification) to 1 (indicating that every class was completely mispredicted evenly across all of the other possible classes). The CEN calculation is described in Wei et al. (2010). In this example, the CEN scores correlate well with the Q_total scores, but give the reviewer confidence that the failings of accuracy metrics are not an issue. Another information theoretic approach, which accounts for “truth information completeness” and the “false information ratio,” is described in Holt et al. (2010). Holt RS, Mastromarino PA, Kao EK, and Hurley MB. 2010. Information theoretic approach for performance evaluation of multi-class assignment systems. Proc. of SPIE 7697: 76970R/1-12.